Former Prime Minister released from prison after parole board ruled that his sentence would be shortened. 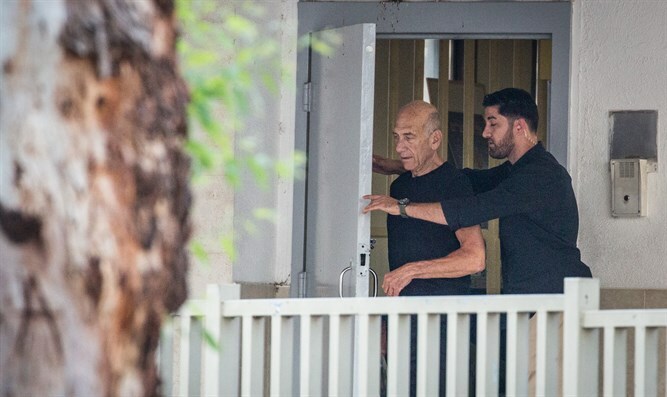 Former Prime Minister Ehud Olmert was released on Sunday morning from the Maasiyahu Prison after serving 16 months, or two thirds of his sentence, over corruption offenses. The parole board last week accepted Olmert's request for early release, days after he was hospitalized after complaining of chest pains. The state prosecutor contemplated appealing the parole board's ruling, but ultimately announced it would not appeal the decision, paving the way for his discharge on Sunday.